I am sure, you have visited at least a few conferences in your life. You remember place, you remember drinking party with friends, and maybe sometimes also some interesting idea resonates with you. You may feel energized for a short while. And if you are frequent visitor, it is more routine, regardless which place in the world you have visited. We in Aguarra are also visitors. We look after details and we apply our learning to create unique experience for you. Let me share with you our highlights. 1. Every year different speakers. 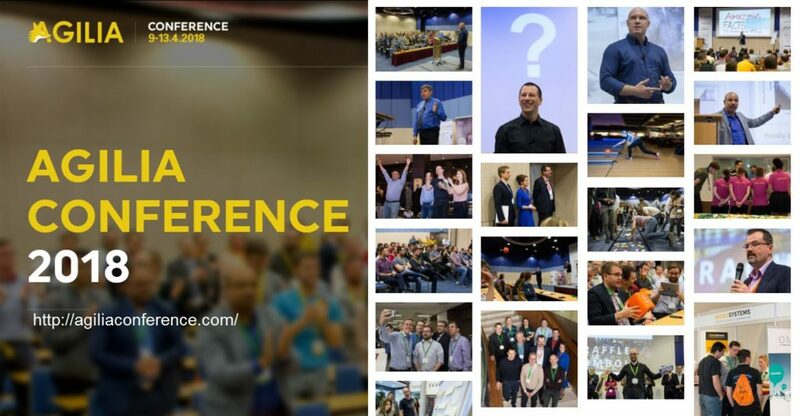 Have you noticed biggest conferences present every year the same speakers? It can be to attract mass audience, but more often there is a relationship among organizer and speaker. While there is nothing bad on the relations, the fact is that only negligibly few people are lucky enough to have new experience and discoveries every year. Most of us needs just more time to mature idea for public. And I do not mention those few coming every year with the same stuff for decade. We want to avoid becoming a club of likeminded. We want to ignite discussions and support diversity to maximum, therefore we have introduced 2 years ban for speakers to present again at Agilia. It helps us to guarantee completely fresh and attractive content for returning audience. 2. All for improvement of tech business at single place. Agile has never been about software development only. Building Agile organization will definitely include also agility in management, in sw development, in financial management, in project management, innovation management, R&D or more. Context beyond boundaries of your organization matter, too. 3. Top personalities from the world of agile and business. While we do not forget authors of agile manifesto and agile software development techniques, we want to invite to the table also new perspectives. While we have respect to big names of agile software development, the future will belong to new names – authors of beyond budgeting, authors of managerial techniques, founders of many agile project techniques, successful entrepreneurs or leading visionaries in particular. Because Agile is evolving. And we want to bring it to you from very first hand, while it is fresh and unique. 4. Verified presenters. All presenters are screened to make sure, they are indeed experts on given topic. No more presentation of “successful scrum deployment” from people with less than few weeks of practice. Agile requires broader knowledge, overview of few disciplines to understand how Agile may help to the organization. While most conferences accept anyone who will apply, we want to guarantee to the delegates only true expertise. 5. Success stories are verified on-site. You have also seen presentation of the company where your friends work. How successful and fantastic their agile transformation is – typically presented by head of agile transformation. You feel intrigued, amazed and fascinated. Only there are words of your friends in your mind, said last weekend at your garden beer party. These starts bitter feeling in your stomach and you guess there is something wrong somewhere, you are only uncertain where. Indeed, we have also seen it. Sadly, nearly 50% of presentations at conferences are fakes or presents near fake achievements. We at Agilia wants to be different. Not anymore presentation of fake results and hidden company PR for HR market. Our conference is the only place in the world with strong screening policy in place. 6. Unique content. Perhaps you are hungry for knowledge. And you wish to visit more conferences in your vicinity to absorb as much ideas and experience as you can. Only to discover same speakers at nearly every event travels with the same presentation like on a “roadshow” across 15-20 conferences around. Everywhere you go, same speakers, same presentations, and lots of your precious time wasted. We at Agilia we demand novel presentations, which were not yet presented anywhere else. We often invest our time and expertise to help design new content and provide feedback. Once, twice, many times until result is great. Simply, presentations are written for Agilia. 7. Presentation of newly published books. Authors of the books choose Agilia as one of their first promo platform. Indeed, we were among first to present Management 3.0, Agile Project Management for Government, Beyond Budgeting, The Scrum Culture – to name a few. And we will continue with The Agile company, Flow, and again with many more. I believe, you will find more reasons to come. Either as a hopeful speaker, to whom we helped build confidence and start his speaking career. Or as a delegate, who found his new job and his career got totally different dimension. Or as new entrepreneur, who gained new ideas and applied them to expand his business. Or as a delegate, who shares his expertise and learns new tricks for everyday life. We are looking forward welcome you at Agilia.